If I recall correctly, I believe when I posted it, I poked a little fun at Morgan. I explained that I had come to the conclusion as to the source of chaos and hilarious stories that come from the Harrison household. My roommate Grace, last semester, was kind enough to tolerate my family for a week and spend Thanksgiving with us. The last day of the sojourn we remembered Grace had her camera and-conveniently enough-Grace is a photography major. Obviously we abused her natural talent and convinced her to take Haylee's senior pictures. At the last minute we threw in a few pictures of the kids. Even in the blizzard. I just found a flash drive I have with a few of the pictures saved on it. The above picture is mirrored; only it looks like the blame and guilt is now focused on Yours Truly. Nice. Maybe Morg and I really are as similar as Mom has always said. But, that would mean she is right. And that can't be. 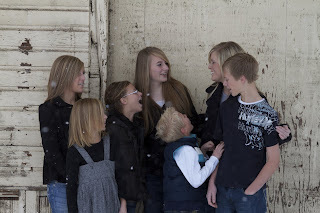 I bet if I look hard enough I could find a picture, like these, for each of the seven Harrison children. Is it possible that we are all equally insane, which causes the extreme level of chaos? There is no question. You are all equally insane. Your dad is the culprit. Your mom is a close second.